Yamaha CPX900 With Built-In Preamp | OhGizmo! By Andrew Liszewski on 01/14/07 • Leave a comment! First it was Gibson who hi-tech’d up their electric guitars with the HD 6X Pro model and now Yamaha is doing the same but with one of their acoustic models instead. Apparently amplifying an acoustic guitar can result in the desired sounds being lost in unwanted but unavoidable feedback so to resolve this the CPX900 features a new 3-way preamplifier system specially developed by Yamaha. The A.R.T. 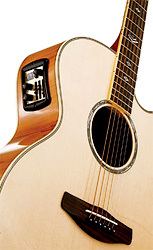 as it’s called (Acoustic Resonance Transducer) uses four special contact pickups strategically placed in the guitar’s audio sweet spots that “dramatically reduce feedback while achieving rich, beautiful and natural tones.” The controls on the side of the guitar also include a 3-band EQ for fine-tuning the sound. The CPX900 lists for $1,400 but can be found online for about $850.